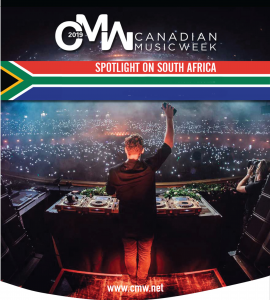 Meet a panel of market specialists, talent buyers, concert promoters and industry decision makers for CWM’s first-ever official mission from the South Africa. Discover access points for theSouth Africa and meet those who can help build bridges between Canada and South Africa. Meet one-on-one with members of the delegations from the South Africa in a session of targeted, curated, pre-arranged meetings customized to your objectives. 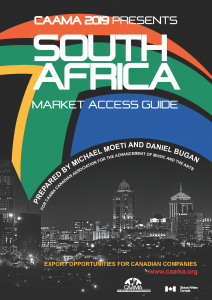 Everything you need to know about South Africa's music industry can be found in the Market Access Guide, produced by the Canadian Association for the Advancement of Music and the Arts (CAAMA). BILLY DOMINGO is one of South Africa’s most respected and successful entertainment industry professionals. With nearly four decades of experience ranging from stage manager to production and even direction, Domingo’s résumé reads like a veritable Who’s Who, having worked with some of the... read moreBILLY DOMINGO is one of South Africa’s most respected and successful entertainment industry professionals. With nearly four decades of experience ranging from stage manager to production and even direction, Domingo’s résumé reads like a veritable Who’s Who, having worked with some of the worlds’ most famous artists and biggest stage productions. espAfrika is a leader in creating and producing unique ‘entertaining experiences. With nearly 20 years in the business, the company has grown into one of the most highly awarded, event management and production organisations in South Africa. espAfrika thrives on understanding clients’ ideas and is exceptional at creating solutions that are relevant and engaging to today’s audiences. 1984 - Chrysalis Music. Worked with host of top songwriters, securing... read more1981 - Air-Edel TV/Film Music - Worked alongside the likes of: Hans Zimmer, Roger Greenaway… 1982 - Air Studios, London, as engineer for Paul McCartney, Dire Straits & the legendary late George Martin, to name a few. Gallo Record Company is the largest record label in South Africa. It is based in Johannesburg, South Africa, and is owned by Tiso Blackstar Group. The current Gallo Record Company is a hybrid of two rival South African record labels between the 1940s and 1980s: the original Gallo Africa and G.R.C. Andre Le Roux is a highly regarded South African arts manager/administrator. He is presently the Managing Director of the Southern African Music Rights Organization Foundation. (SAMRO Foundation is the largest private contributor to music development in the Southern African region). Serving... read moreAndre Le Roux is a highly regarded South African arts manager/administrator. He is presently the Managing Director of the Southern African Music Rights Organization Foundation. (SAMRO Foundation is the largest private contributor to music development in the Southern African region). Jotam Matariro is a copyrights professional from Johannesburg, South Africa. He is the Chief Executive Officer of the Composers, Authors and Publishers Association (CAPASSO), the leading Mechanical Rights Hub in Africa. Has over 10 years executive management experience, 5 years of which are in... read moreJotam Matariro is a copyrights professional from Johannesburg, South Africa. He is the Chief Executive Officer of the Composers, Authors and Publishers Association (CAPASSO), the leading Mechanical Rights Hub in Africa. Has over 10 years executive management experience, 5 years of which are in Managing Mechanical Rights in Music. As CAPASSO CEO, Jotam’s vision is to set up a Digital Licensing Hub for Music in Africa within the next two years. With more than 20 years of experience in the entertainment industry, mainly music, publishing and film production, Michael has shaped the careers of South Africa and Canadian talent. In the late 90s he launched independent labels both in Canada and South Africa working with emerging talent such as... read moreWith more than 20 years of experience in the entertainment industry, mainly music, publishing and film production, Michael has shaped the careers of South Africa and Canadian talent. In the late 90s he launched independent labels both in Canada and South Africa working with emerging talent such as the late award-winning R&B artist TK (South African) and rap group Rascalz (Canadian). Besides embracing indigenous local music recording an album with legend Mahlathini II, his label, ADMC/LOKSHIN VIBE, is developing a diverse roster of artists for international markets. Through his foray into publishing for the university student market in 2007, he produced and launched a Campus Hits Vol. 1 compilation album. He has widely traveled internationally to music markets and conferences to position local talent with a signature township sound. With his vast business experience and network in the music industry, Michael has been commissioned by CANADIAN MUSIC WEEK to mobilize and coordinate a spotlight of the South African music industry at its forthcoming festival and conference in May 2019. As part of digital convergence, Michael has also done a lot of work in the Film/TV sector, as both a business consultant and producer. he has co-produced the Soundtrack for TV series Molo Fish., the first coproduction between South Africa and Canada. His specialty has now extended into selling quality content to international market. He is currently forging international partnerships with film production companies and distributors from both Canada and the USA. Through ADMC, Michael is in negotiations with American partners, to develop and co-produce a slate of commencing in films 2019. In addition to the co-productions, he is working with international to build a state of the art mega film studio in the north of Johannesburg. Lokshin Vibe (LV) is an independent multimedia company and artist brand manaementy agency borne out of a collaboration between two companies specializing in different aspects of CDC (convergent digital content) production, ADMC and Sidewalk Productions. Inspired by American urban music independent outfits such as Bad Boy, Uptown Records, Def Jam, RocNation and TDE. LV’s mission is to produce and globally market/distribute organic sounds of the Mzansi township in various genres, mainly Kasi Rap, Kasi Rock and organic Afro Soul, a mixture of indigenous African music, jazz, soul and hip hop. Beyond producing and or publishing licensing music to be commercially marketed/distributed internationally, we’ve developed a comprehensive artist development and management system that utilizes various multimedia channels, supporting the artist at every stage of their creative/career growth. The smart partnerships we have with a number of independent labels has resulted in Lokshin Vice having a strong 15-artist multi-genre catalogue. In addition to this wide range of recorded artists, we’re also working with developing a number of young a talented artists whose music is in line with our vision, as they fit the description of Lokshin Vibe. Cape Town based Martin Myers started out in the music industry by running UCT Radio back in 1985. This was when he decided that he wanted to make a career in the music business. Martin’s break came when he organized... read moreMartin Myers is a music DJ and publicist based in Cape Town, South Africa. A creative, passionate exec. 12 years of experience in the music business specialising in business development within the African territory. Results-driven, competitive decision-maker with an excellent track record & an expansive international network across the entertainment & media... read moreA creative, passionate exec. 12 years of experience in the music business specialising in business development within the African territory. Results-driven, competitive decision-maker with an excellent track record & an expansive international network across the entertainment & media industries. Speaker at a number of conferences namely Canada Indie Week, Canada Music Week, M Pour Montreal, Eurosonic (18 & 19), Next CEO conference (Mauritius) & Music Matters Singapore.SJN Agency are the African music and artist expansion experts. The Agency’s focus and success ranges from regional to global music marketing, as well as in growing and supporting both new and existing brand campaigns inside and outside of Africa. Responsible for South Africa’s first Double Platinum selling local artist: Locnville (MTV EMA Best African Act 2013) & Mi Casa. Outside of Africa our talent have performed at SZIGET, Roskilder, Tomorrowland Unite, Afropunk, Ultra, Global Citizen, Fusion Festival, MAMA, Primavera, MIDEM, SXSW, ADE, Rock in Rio, Canada Indie Week, M for Montrael, Music Matters Singapore & more! Licences w/ Armada, Spinning, Universal (Africa), Warner (Africa), Sony Music (Africa). Mpumi Phillips manages the creative department at Sheer Publishing where she handles music clearances for film, television and commercials, and works with a wide range of clients, including artists, composers, production houses, Advertising agencies and post production companies. Previously she... read moreMpumi Phillips manages the creative department at Sheer Publishing where she handles music clearances for film, television and commercials, and works with a wide range of clients, including artists, composers, production houses, Advertising agencies and post production companies. Previously she was a music supervisor for films such as Angus Buchan’s Ordinary People, Babalas, iNumber Number, Nothing for Mahala and Inside Story. He is... read moreTheresho Selesho has been deeply involved in the live music, entertainment and broader creative industry in South Africa for just over a decade. Dr. Sipho Sithole is an award winning producer and former Deputy Managing Director of Gallo Music Group and is credited for coining the now most popular genre in South Africa, ‘Afro- soul’, after his successful signing and producing of artists such as Thandiswa Mazwai, Siphokazi, Simphiwe Dana,... read moreDr. Sipho Sithole is an award winning producer and former Deputy Managing Director of Gallo Music Group and is credited for coining the now most popular genre in South Africa, ‘Afro- soul’, after his successful signing and producing of artists such as Thandiswa Mazwai, Siphokazi, Simphiwe Dana, Camagwini, Pu2ma and Tribute Birdie Mboweni, Brenda Mntambo, and more. Sipho founded a leading independent record label, production house and artist management company Native Rhythms Productions and NATIVE RHYTHMS RECORDS is known for mainstreaming hip-hop in South Africa for breaking the careers of artists such as Skwatta Camp, Pro Kid, Zuluboy, Zakwe and recently Kommanda Obbs. Dr. Sithole has been a director on numerous boards of directors, such as Momentum (subsidiary of Firstrand Limited, ACSA, Nu Metro Africa, Johnnic Entertainment as well as the Moral Regeneration Movement, Joburg City Theatres. He is the current Chairperson of Moshito Music Conference and Exhibition and also sits on the board of the Recording Industries of South Africa (RISA). An extraordinary presence in the music industry for over 30 years, Antos Stella is one of the most respected businesswomen to emerge from the industry. Her artist relations have been one of her major strengths, enabling her to successfully bridge the gap between the creative and business worlds. Antos has been instrumental in some of the countries biggest international artist deals, an ambassador for the country internationally as well as a leading content aggregator focused specifically on the relationship between telecommunications and the digital distribution of local and international content. Antos and her team at CCA are expanding the distribution of content to include not only music but mobile television and video content too. South Africa’s biggest record label as legal secretary. of South African artists to the rest of the world. 8. 2012 Management buy out of Content Connect Africa (CCA) from Blue Label. Renneth Tshisikule spent the last few years at the helm of IMEXSA developing and increasing the number of music exporters in South Africa through identifying trade opportunities globally, and assisting African music companies and independent musicians to take advantage of those opportunities.... read moreRenneth Tshisikule spent the last few years at the helm of IMEXSA developing and increasing the number of music exporters in South Africa through identifying trade opportunities globally, and assisting African music companies and independent musicians to take advantage of those opportunities. She’s also the founder member of one of South Africa’s biggest talent search projects for export, The SA Indies Music Week, which turns six in 2019.